In 1893, the Marist Brothers were invited to teach in St. Francis Xavier's College, Shanghai, which was founded by the Jesuit Fathers. In 1896, our Brothers were given full responsibility for the College. 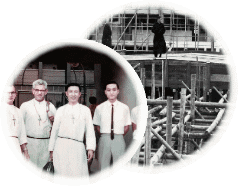 After the College was re-organized in 1950, our Brothers came to Hong Kong and gave religious instruction in St. Martin's English School. Two years later, the Brothers were asked to take over St. Martin's. In 1954, with the help of the Education Department, new school premises were built at the junction of Maple Street and Sycamore Street. 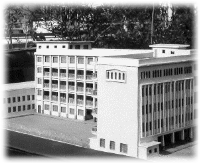 This is our Brother school, St. Francis Xavier's College, Kowloon. During the early 60 years, the ex-British Hong Kong Government intended to develop Tsuen Wan to be a new town. Due to the rapid increase in the population in Tsuen Wan and extremely high rate of demand on secondary school (There was only one secondary school in T.W. at that period), Rev. Bro. Bosco Wei representing the Marist Brothers (the First Principal of SFXS) decided to found a college in Tsuen Wan so as to foster outstanding youngsters.